It’s that time of year again! I wanted to kick start all of the festive content over the next month with something really exciting, so the gift guides are coming out early this year! 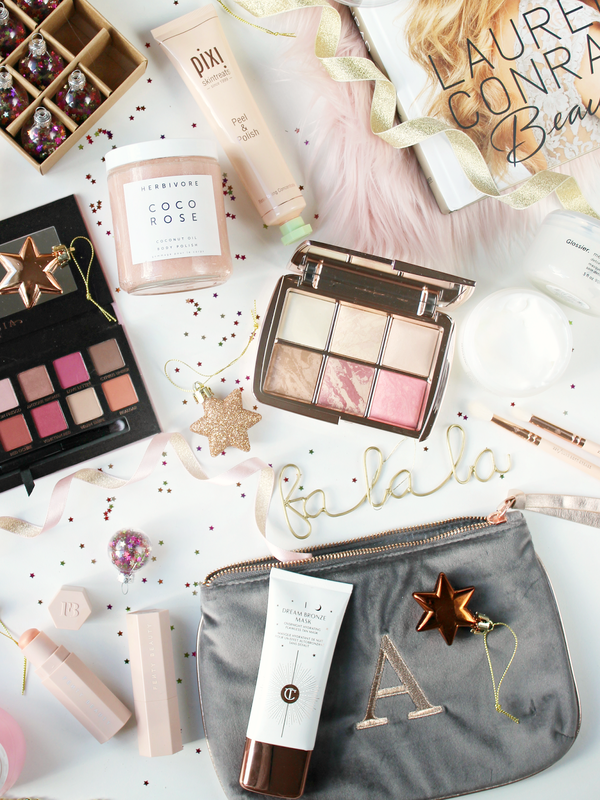 As this is primarily a beauty blog (and I’ve been trying out lots of new beauty bits lately), I thought I’d start with my beauty gift guide. Starting with skincare, I thought I’d do a little bit of a brand focus on Pixi. It’s definitely one of my favourite brands, especially when it comes to choosing products for my skincare routine, and I know lots of their cult favourites would make wonderful gifts for beauty addicts. A couple of my absolute favourites are the Double Cleanse* and Peel & Polish*. The cleanser is a hefty jar which makes it a substantial gift, and it comes with two products inside – a cleansing balm and a cream cleanser. Both formulas are extremely nourishing and give the face a really deep clean after a long day… a total skincare must-have for every makeup wearer. I’ve mentioned the Pixi Peel & Polish* in my wedding skincare prep post, and I stand by the product throughout the winter months as well. It does exactly what it claims and is radiant skin in a tube – perfect to gift those who love to boost their glow. Glossier is another brand with lots of skincare gems to choose from, especially if the person you’re buying for is into pretty packaging too! I’m particularly smitten with the Glossier Mask Duo which contains two perfect products for any skincare junkie. It comes with the Mega Greens Galaxy Pack for a quick skin detox and the Moisturizing Moon Mask to soothe and hydrate afterwards. If you’re looking to spend a little more, a skincare tool that I’ve mentioned quite a bit this year is the Magnitone Barefaced Facial Cleansing Brush*. It’s a really good investment and would make a really thoughtful gift – and it even comes in limited edition rose gold for the festive season! I thought I’d touch a little on body and hair care as well – the Bardou hair care products are a favourite of mine, and I reviewed a couple of products earlier this month. For the gift of swishy hair, I recommend the Finishing Mist Hairspray*. My new bodycare brand favourite is definitely Herbivore Skincare and I’ll be writing a post up on them soon. I’ve featured the Coco Rose Body Polish on my Instagram a few times but I thought I should mention it here too. It’s such a luxurious bath time treat. Moving onto makeup, I’ve been obsessed with Hourglass powders for years now and my most recent purchase from the brand is the new Hourglass Ambient Lighting Edit Volume III. It contains six stunning powders, varying from setting powders to blushers and bronzers, and it’s the perfect travel companion. I’ve used mine non-stop, so I know it would make an absolutely perfect gift for any beauty lover who loves a little luxury in their life. For those who love their eyeshadow, one of my favourite palette discoveries this year has to be the Anastasia Beverly Hills Modern Renaissance Palette. It was released last year but the hype is still there, and for good reason – the shadows are extremely blendable and soft. The colours work together really well and the palette as a whole can create a whole variety of different looks, particularly for the festive period. I thought I’d include a couple of gift ideas for sculpting the face as well. A gem for the most beautiful bronze glow is the Charlotte Tilbury Overnight Bronze & Glow Mask, which would make a wonderful gift for all the parties this season. I reviewed Rihanna’s beauty line earlier this year after its launch in September. I’ve been using the Fenty Beauty Match Stix Trio non-stop for a really easy but gorgeous contour, so I know it would make the perfect present for those who want a fool-proof product for chiseled cheekbones. These are available in shades for everyone and you can mix and match according to the person you are gifting them to. Speaking of personalised gifts, monogram products are always a lovely little touch for someone you don’t necessarily know that well. Matalan have a lovely selection of affordable monogrammed gift ideas including this velvet makeup bag. It’s a great size to throw into a bag or travel case with some makeup favourites. 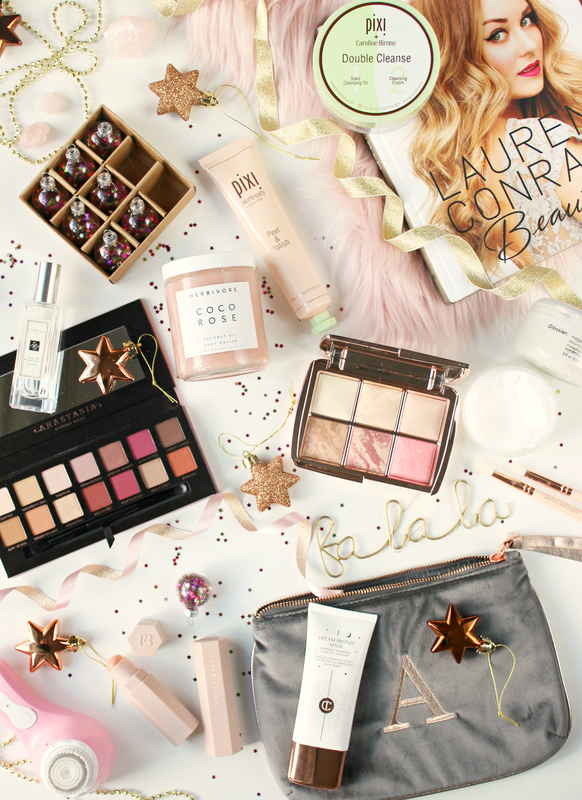 I also love gifting coffee table books, and for beauty lovers, Lauren Conrad’s Beauty book is perfect. It’s filled with stunning photographs, tips and tricks – such a gorgeous gift. If you’re brave enough to gift fragrance, Jo Malone is my go-to recommendation. I love nearly all of their scents and I feel like a lot of them are well loved by everyone. One of my favourite discoveries this year is the Peony & Blush Suede scent which I’ve added to my collection and nearly used up entirely! What are your favourite beauty gift ideas? Previous Post Let’s Talk Glossier. Next Post Gift Guide: For Him.